The basis of any personal injury claim is negligence, which refers to actions or inactions by one person that result in harm to another person or property. The reasons the courts have a negligence standard is because they realize that nobody is perfect and that accidents do happen despite one’s best intentions to prevent them. To separate a typical accident from an act of carelessness, the courts implement the “standard of care” rationale, which forces a jury or decision makers to examine what any other “reasonable person” would have done in the same circumstances. Who is the “Reasonable Man”? The reasonable man theory refers to a legal test the courts use to determine if someone acted with negligence. This test involves calling to mind a hypothetical person to use as a legal standard in any given situation. This hypothetical person exercises average care, judgement, and skill in behaviors that society expects of its members for their own and others’ interests. After developing a “reasonable person” standard, the courts will compare the defendant’s actions to the hypothetical actions of those of the hypothetical person. If the courts determine that the defendant did not live up to the reasonable person standards, it will deem the defendant negligent, which means he or she could be held liable for harms he or she caused. How Does the Jury Come Up With the Reasonable Person Standard? When jurors are asked to call to mind a reasonable person, they must bring to mind a model citizen, or someone who emulates how an average person, with normal care, would behave in a similar situation. Because the test of how a reasonable person would have acted is an impartial one, it does not take into consideration each defendant’s unique circumstances or abilities. Thus, even if a person is known to be chronically careless, or even if he or she is below average intelligence, the standards the courts create apply all the same. Because the reasonable person is just a figment of the court’s imagination, many wonder how the courts come up with the standard. Generally, in making this decision, the jury will consider both the defendant’s conduct and what he or she knows, should know, has experienced, and has perceived. For instance, say the defendant was a lifeguard at a local pool. Part of his job involves mopping up puddles of water so patrons do not slip. During one of his shifts, he notices a puddle of water but, because he is to go on break in five minutes, he decides to leave the mopping for afterward, even though there are still people in the pool area. Within that five minute span, a child slips and breaks her arm. 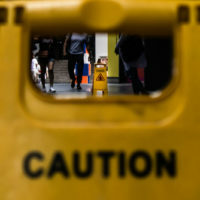 In this instance, the jury would take into consideration the defendant’s actual knowledge of the puddle and determine whether a reasonable person would have mopped it up given the same circumstances. In addition to the defendant’s actual knowledge, the jury will also consider what should be common knowledge. For instance, the jury might decide that any other reasonable person would know a) the puddle, left unattended, could cause someone to slip and b) children tend to run around pools despite there being obvious hazards. The reasonable person standard applies in every civil case involving personal injury. Yet, many individuals are unfamiliar with what this standard is and how the courts come up with it. To learn more about the reasonable person standard and how it may apply in your case, contact Spencer Morgan Law by phone or online today.